Dogs in the Library is back in session! It’s easy to let the stress of university life get you down. You’re exhausted from an all-night study binge... that big research paper is due next week... and you have to spend all weekend working on that group project… You know what might help? A canine pick-me-up. 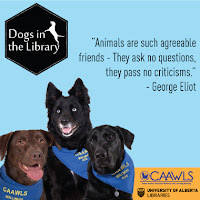 University of Alberta Libraries will once again be offering dog therapy sessions with the feel good experts from CAAWLS (Chimo Animal Assisted Wellness and Learning Society) throughout the fall and winter terms. Pet therapy is a fun way to decrease feelings of loneliness and anxiety. The dogs of CAAWLS are wonderful listeners, love meeting new people and are happy to indulge in a cuddle. I hope I run into Cappuccino this Tuesday at the Education Library!